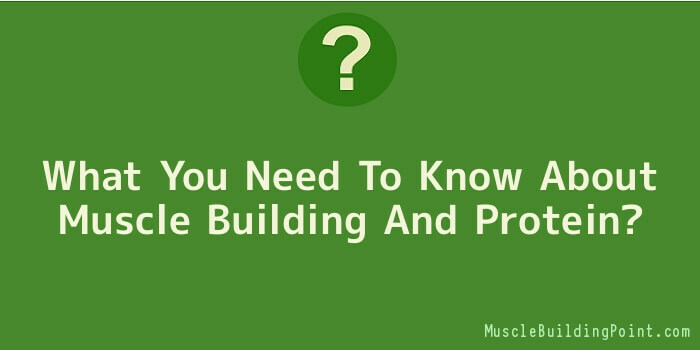 Muscle proteins account for approximately 50% of the total body protein with majority being used for muscle structure. Muscle building actually relies on availability of adequate proteins and this is reliant on the balance between protein intake, re-synthesis and protein breakdown. To achieve muscle growth, you are required to combine both body weight and a positive protein balance. During heavy workout, your muscles are usually forced into protein breakdown. To promote muscle growth, the protein that has been broke down actually needs to be positive. Therefore, if you want to build muscle, you actually need to consume some protein. 1. How much protein should someone take for optimal muscle growth? When it comes to muscle building, you will actually find no shortage of advice regarding what you should eat, how to train and what sort of supplements you should be taking. Unfortunately, there has been a lot of misconception and one of the biggest one is that you must actually eat a lot of protein if you must to gain muscles. It true that you do need more protein when you are muscle building but the total amount needed is less than what many people think. Athletes and those people who want to build more muscles need to consume about 1.2- 1.7g of protein/kg of body mass while a sedentary person needs to eat about 0.8g of protein/kg of body mass each day. Above this, there is no evidence of further benefit to muscle growth. 2. When is the best time to drink a protein shake? Although it can vary depending on the brand, most experts actually recommend taking protein in two serving. The first one should be taken one hour before you start your workout to rejuvenate you body energy reserves and another dose should be taken immediately after the workout to help fuel the growth of new muscles and also repair damaged muscles. 3. Is it dangerous to eat too much protein? There is a research suggesting that consuming too much protein can actually leave you dehydrated and may also increase the risk of getting kidney stones, gout, osteoporosis and cancer. Studies have also shown that consuming too much of anything from water to vitamin can be bad for your health. Nutritionists recommend that you should not take too much protein just because you want to build your muscle. Only consume what is required and you will achieve the best results.